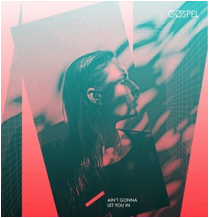 We've been huge fans of Gospel since their debut track Disasters Running Wild dropped last year, closely followed by their first single EMPR. We've waited patiently for their next offering and we're not disappointed with their latest two-track single which pairs Ain't Gonna Let You In with the appropriately titled The Other Side. The lead track Ain't Gonna Let You mixes dreamy atmospheric laid-back verses which show off the subtle elegance of Beth Anderton-Allen's vocals with a harder electronic chorus. It will draw inevitable comparisons with the likes of Chvrches, but to us, Gospel's intrinisic love of melody makes them stand out from the impressive selection of female-fronted bands that are gaining a substantial following at present. The Other Side is testimony to that thought. It's a brooding masterpiece that builds slowly before showering the listener in an explosion of shimmering shifting electronica. Whisper it quietly, we're that impressed by it that we prefer it to the lead track. Gospel are on Facebook and Twitter. The single is out now and can be purchased from their Bandcamp page which is the only place where The Other Side will be available. They support the launch with a show at The Waiting Room in Stoke Newington on Wednesday 24th June.